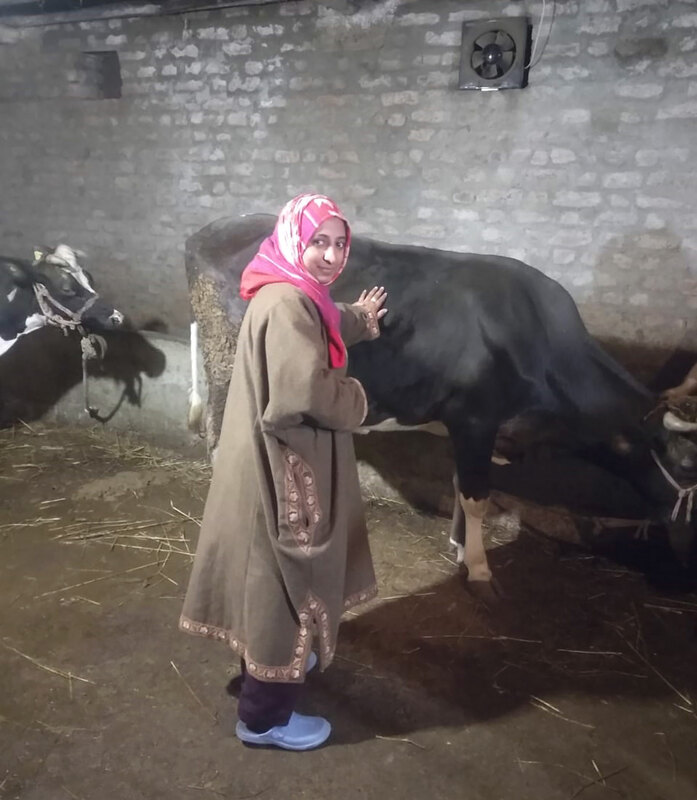 In Kashmir for an urban woman law graduate, just into the practice, the idea of rearing cows is both rustic and rebellious but 28-year-old Saima Nisar Sheikh of Srinagar’s Pantha Chowk “doesn’t care”. She has taken it upon herself to fight the menace of milk adulteration prevalent in the market. She understands it is a “long and tough fight” but she wants to hit the target in her own humble way. After completing her BA LLB from the University of Kashmir in 2013, Saima started practising at Srinagar’s lower court. After spending three years defending her petitioners in the courtrooms, Saima thought of her dream. What basically prompted Saima to shape her ideas and allures into a reality, was a poor quality milkshake at a cafe back in her university days? She along with other friends talked about the adulteration of milk and other food products in the market. It was there the idea of the dairy farm came in and she made her mind to do something about it. Saima along with her friend Muzamil Bhat started figuring out the possibilities. Saima and Muzamil latter on tied the knot as well. Almost, for three years they researched and met experts. Finally, her dreams took the shape last September, barely a month after the marriage, when she bought two cows. Her family supported her, though there were some voices that said the idea was “odd”. “Without my husband’s support, I think it was impossible to see this dairy farm becoming a reality,” Saima said. She also approached Jammu and Kashmir Entrepreneurship Development Institute (JKEDI) to get training and a loan. She got a loan of Rs 22 lakh and even put almost her own savings of around three lakh into it “I constructed cowshed and bought some cows with the sanctioned loan,” she said. Detailing about the requirements for the dairy farm, Saima said the primary requirement was of the availability of the land which she got leased from her father-in-law. The farm is spread over an area of two kanals of land at Khonmoh Srinagar. To plunge into the dairy market and making it commercial, Saima added more cows to the farm. At present Saima is rearing nine cows and six calves on her farm. Out of them, eight cows are in milking condition. She also employs a family of six members for their maintenance at Rs 15,000. Besides, the family gets milk for their personal consumption every day. Saima’s farm produces about 70 litres of milk per day. She sells the cow dung as manure. But the expedition that Saima decided to tread over, was not a cake walk. She had to struggle and stand steadfast like a rock to see a dairy farm running successfully. “It is not just you make a plan and execute, there is a social taboo attached to it. But, when it is a girl, running a dairy farm, is much more than a taboo,” She admitted. “Those people who were of the idea that I am probably doing an odd job are now appreciating me. They come to seek expertise from me on entrepreneurship,” added Saima. Life, as they say, is all about the dreams. You realise one, you have another target set.